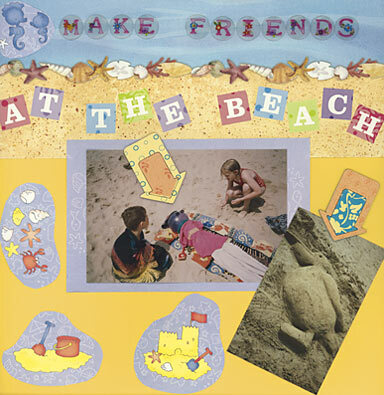 This beach scrapbook layout features two 'friends' my children met on the beach - one they 'made' themselves and the other they literally stumbled upon! It's an unusual holidaymaker that leaves a pelican behind, but it's a lot more pleasant than empty drinks cans. I love some 3D embellishments on most layouts, and on this page I wanted the accents to feel like items washed up on a beach. I tried for ages to simulate seaweed on the layout, using mulberry paper. It looked so pants I had to start the whole page again. I might have another go at it some time soon, and upload it onto this page so you can have a laugh! SO WHO'S THE GUY WITH THE BIG ROUND HEAD? This feller is my children's creation - made from a beachball, t-shirt and towel. (I guess you had to be there). Had I made this beach scrapbook layout now I would almost certainly have used Jen Gormley's '500 Scrapbooking Sketches' as before I saw this I would usually start a layout with ideas of journaling and photos but zero idea of the 'big picture'. Now, if you scroll down about half way on this page you'll see how Jen has created a great looking layout from a sketch template - which not only improves the end result but saves us all that 'umming and erring' when we can't decide what goes where. I like the watery effect of dome stickers so I used some by Papermania, the 12x12 in amber also coming from this source. Those 3D embellishments are from HMA Creative. A while ago, I was very lucky to receive a whole pile of stash from the excellent UK title 'Scrapbook Magazine', who were kind enough to send me all manner of papers when they published one of my layouts. I'm afraid most was unmarked so I might struggle to replenish it unless I get lucky. The lettering and beach motifs fall into this category. , but there's no law against using it again!